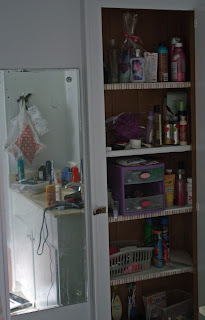 The bathroom can be a very cluttered and chaotic space, especially when it’s a smaller bathroom like mine. 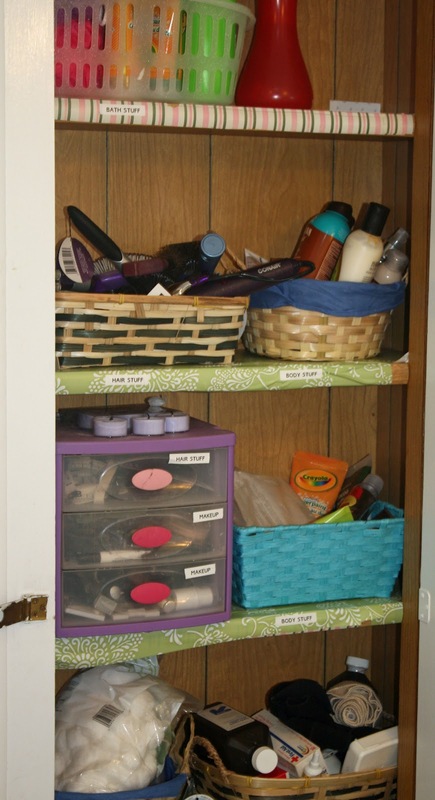 So here are some simple organization ideas to get your bathroom more organized. 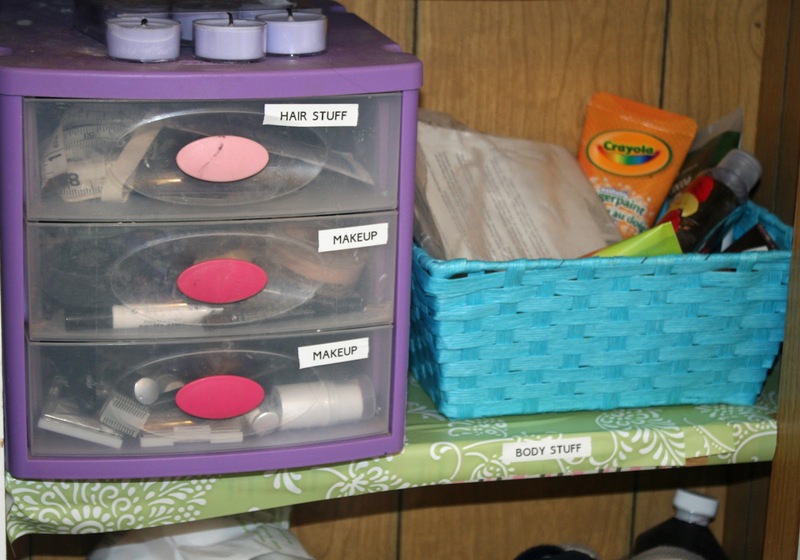 The best part is that these simple organization ideas will cost you less than five dollars. This whole project cost me 5 dollars. 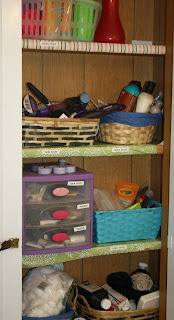 I went to the dollar store and got the green contact paper to cover the shelves in. I really need more practice with that. Luckily the shelves are pretty full so no one can see how badly laid the paper is. Then I bought 4 one dollar baskets. The bright blue basket and the three drawer purple container were already mine. I emptied everything out of the cupboard to begin with, then through away things that were empty or old, that got rid of a lot. Then I grouped things that were like each other together and put them in baskets. Like lotions together. Then when I put the baskets in I got my label maker out and put labels in front of things. That way both my husband and I know where things belong. 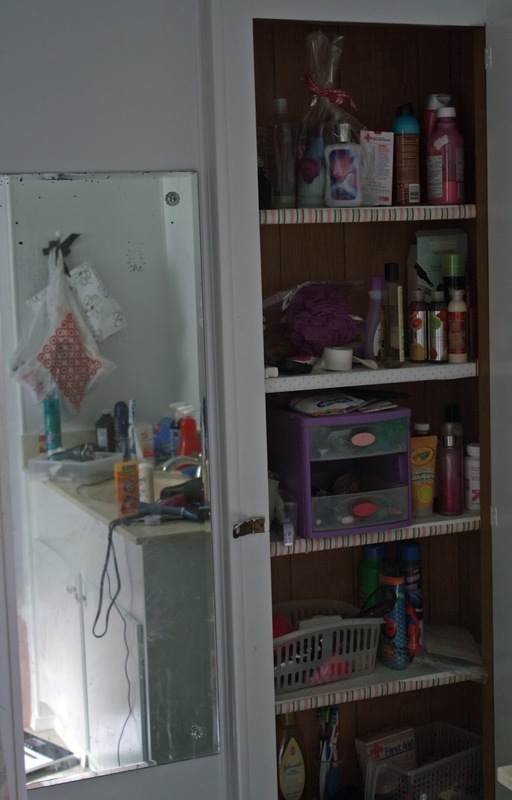 It also helped me clean the counter of, you can see the reflection in the mirror of how messy the counter was in the before picture. Now that things had specific spots they were easy to put away. All in all I think it was a good use of $5. I love that making small changes makes such a big difference! I don’t even have a label maker, so it’s awesome that you can put yours to good use. Thanks for visiting my blog! Hope to see you again soon. Always feels so good to get organized, doesn’t it? Thanks for linking up. I love reorganising! Amazing how having a place for everything helps with the tidyness of stuff! Looks great! I would love it if you joined and contribute your awesome posts at my link party at City of Creative Dreams on Fridays 😀 Hope to see you there at City of Creative Dreams Link Party!